Diaz, M.; Paillacho, D.; Angulo, C.; Torres, O.; González, J.; Albo-Canals, J. In order to observe spatial relationships in social human-robot interactions, a eld trial was carried out within the CosmoCaixa Science Museum in Barcelona. The follow me episodes studied showed that the space con gurations formed by guide and visitors walking together did not always tthe robot social affordances and navigation requirements to perform the guidance successfully, thus additional communication prompts are considered to regulate effectively the walking together and follow me behaviors. In order to observe spatial relationships in social human-robot interactions, a eld trial was carried out within the CosmoCaixa Science Museum in Barcelona. The follow me episodes studied showed that the space congurations formed by guide and visitors walking together did not always tthe robot social affordances and navigation requirements to perform the guidance successfully, thus additional communication prompts are considered to regulate effectively the walking together and follow me behaviors. Diaz, M. [et al.]. 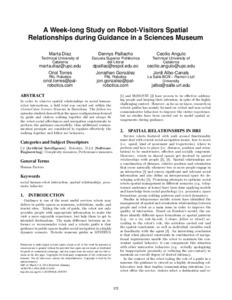 A week-long study on Robot-Visitors Spatial Relationships during Guidance in a Sciences Museum. A: ACM/IEEE International Conference on Human-Robot Interaction. "Proceedings of the 2014 ACM/IEEE international conference on Human-robot interaction". Bielefeld: ACM, 2014, p. 152-153.